Winhost Review 2019: Is Winhost a Good Hosting? If you are looking for windows hosting only, what better option than a company that focuses solely on windows hosting - Winhost is a good bet. Winhost was founded in 2009 and is based in the U.S.A. It specializes in windows hosting and manages all their hardware themselves instead of outsourcing. Their in-house management and that they focus on windows hosting only are what has made Winhost a success today. If you already own a website, you can migrate it to Winhost free. Their migration service is top notch and all you need to do is share your website details with them, schedule a time for migration, test the successful migration on a secondary URL, and then switch it to your main site. This way, you avoid any data loss or trouble during migration. As part of their emergency recovery plan, they create daily system backups. However, there aren’t any backups of your website. In case something goes wrong and you haven’t backed up your website on your local computer, you can ask them to recover the site for you for a small fee. This, however, does not guarantee the recovery of all the latest files. If backup is important to you, you can use their SiteBackup service so you can even automate the backup process. You also get an isolated application pool with both full trust and medium trust control. While using ASP.NET, you can toggle between integrated or classic ASP.NET mode. To achieve this, you can use the tools available in the Winhost control panel. With the help of the application and pool recycle tool, you can shut down a running process or start a new one. This comes in handy when one of your applications isn’t working properly and you need to restart it. The best part is that the other applications aren’t affected by this as each website has its own application pool that is isolated from the other websites. There are three packages on offer named Basic, Max, and Ultimate. The Basic package offers 3GB disk space and 50GB bandwidth which should be enough for the casual blogger or small website owners. The Max and Ultimate packages are where the bigger website owners can benefit. Both offer unlimited disk space and bandwidth. Max package offers 30 FTP user accounts while the Ultimate package offers 100. There is no reason why the Max package cannot fulfill all your web needs even if you have large websites. The price is reasonable. The ultimate package, however, looks on the expensive side. You have to ask yourself the question if you really need those extra features. As mentioned, the Max package should be enough for most website owners. The help and support section consists of a knowledge base section that answers a lot of questions people generally ask. The website has its own forum where the troubleshooting section is quite active. This means most of your queries should be answered quickly in the forum. There is no live chat, but the ticket support system is available 24/7 and you can expect a quick reply. Winhost only offers Windows hosting but does a pretty decent job at that. Its packages and support look good enough for it to be the right windows hosting solution for your websites. 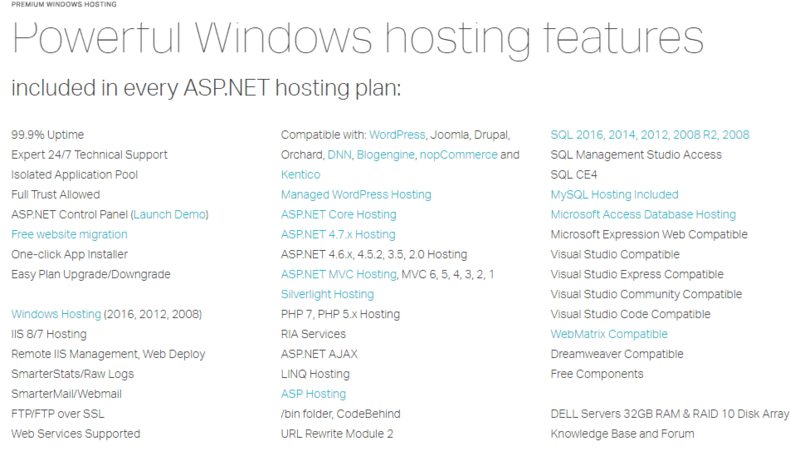 Wondering how Winhost stacks up against other Web Hosting companies? Enter any other Web Hosting company and we will give you a side-by-side comparison.